interesting history, and maybe even something you can do with a group of friends or perhaps with your organisation. If so, you need not look any further. An ARK Playfield Tour may be just what you are looking for. I am sure many of you have either been greeted by an ARK (Advisor of Rubi ka) before, maybe you have even attended a party or a wedding ceremony that they have organised or been part of. What could be more fun than spending some time seeing where they hang out when they aren't busy answering our petitions!! The ARK Play field is one quite separated from the usual places on Rubi Ka. Rubi-kan citizens cannot just pop for a visit. 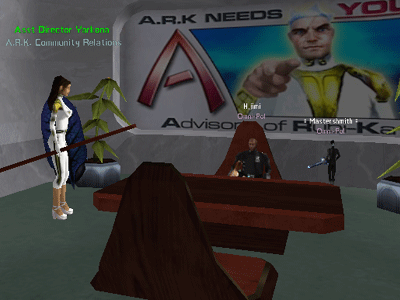 Therefore, on Sunday 28th September, we (Omni-Pol on Atlantean) organised to meet with Assistant Director Yarkona from ARK Community Relations to have a tour around the ARK Play field for our organisation. We met with Yarkona in ICC and were safely (honestly, no limbs were separated from their owners!) teleported to the ARK Play field. We were joined by two other members of ARK - Staffing Guardian Tyrnar and Director Frostrune. The more the merrier!! play field. It contains offices and a meeting room amongst other things. 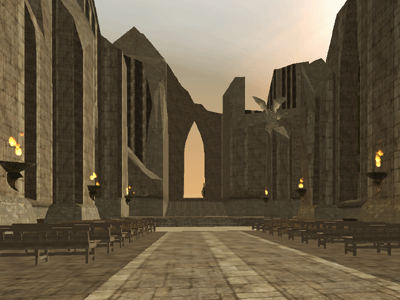 The inside walls of the Headquarters building held some wonderful images from across Rubi ka and the Shadowlands, you can also catch a glimpse of the Ceremony Hall from the windows here. On our way out of the offices, we also had a look around in the large meeting room. The room has hosted OOC RP meetings in the past that players have attended... and I am sure many other events. From the Headquarters, we began a tour of some of the island. The island surely has some nice places for ARK to hang out ... should there be the time to do so! Walked up the hill to the Ceremony Hall where the ARK members hold their weekly ceremonies. and also got to have a look inside the Ceremony Hall. 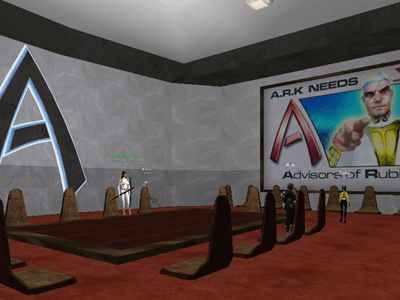 So there you have it, the ARK Play field tour. We were with Yarkona for approximately an hour and found out a lot of interesting things and saw a lot too. Obviously though, it would be silly though if we gave away all the ins and outs of the tour - you should perhaps think of going yourself!